The smell of sweet potatoes always makes us think of winter — so when you’re looking for winter cocktails, a sweet potato liqueur would fit right in. Provided you can find one. 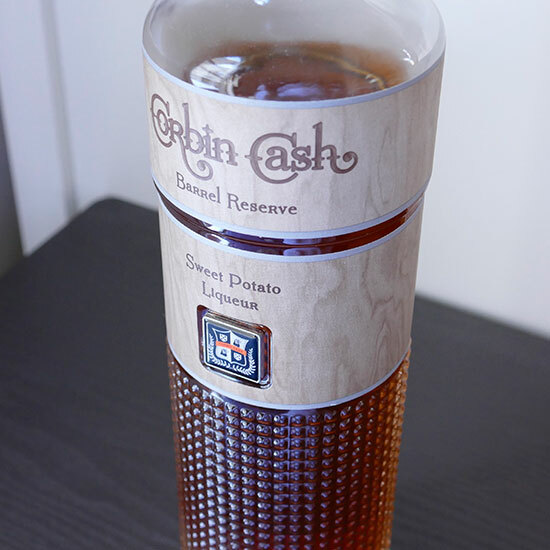 And we did: The unusual Corbin Cash Sweet Potato Liqueur is made by founder and distiller David Souza, a fourth-generation sweet potato farmer. The sweet potatoes are distilled to make vodka, but also to create this liqueur, where their distinct flavor comes through clearly. It’s distilled at a lower proof so it keeps more of that sweet potato character, aged in charred American white oak barrels for up to four years, then sweetened up just a bit with sugar and spice. The resulting liqueur tastes like a sweet potato whiskey, sweetened a little so that it tastes something like a cocktail itself — a cocktail that’s also a sweet potato pie, let’s say. But it translates well to other cocktails, too. Here are three we love. With a little sweetness and a little spice, this sweet potato liqueur almost tastes like an Old Fashioned on its own — but with a backbone of strong dark rum, plus some bitters to balance, it’s even better. Instructions: In a mixing glass with ice, stir together 1 ounce of sweet potato liqueur, 1 ounce of good dark rum, 1/4 ounce of simple syrup, 1 dash of Angostura bitters and 3 dashes of orange bitters. Stir until very well-chilled. Strain over fresh ice. Squeeze 2 thick orange peels over the glass to release their citrus oils, and add as a garnish. It doesn’t take much to turn this sweet potato liqueur into a wonderfully comforting toddy — just a bit of sweetener and a whole lot of spice. Instructions: Add 2 ounces of sweet potato liqueur and 1/4 ounce of simple syrup to a heat-safe glass. Add a dash of Angostura bitters. Heat 2 ounces of water to a near-boil and pour into glass; stir briefly. Stud an orange slice with a few cloves, squeeze it in, and leave in the glass. Garnish with a long cinnamon stick and star anise. Apples and sweet potatoes are an obvious combo, right? Shake the sweet potato liqueur together with seasonal apple cider for a refreshing tall drink with the faint flavor of all those great winter spices. Instructions: In a cocktail shaker with ice, combine 1 1/2 ounces of sweet potato liqueur, 2 ounces apple cider, 1/4 ounce of simple syrup, and one dash Angostura bitters. Shake until well-chilled, then strain into a tall glass with fresh ice. Top with an ounce of club soda and garnish with an apple slice.